The measures on the high gain channel showed quickly an important deviation from design : a gain of approximately 60 instead of 96 and an offset around -600 mV. These facts were reproduced entirely in the simulator by adding parasitic resistors in several key connections (see figure below : parasitic resistors on the high gain channel are drawn in dotted lines). 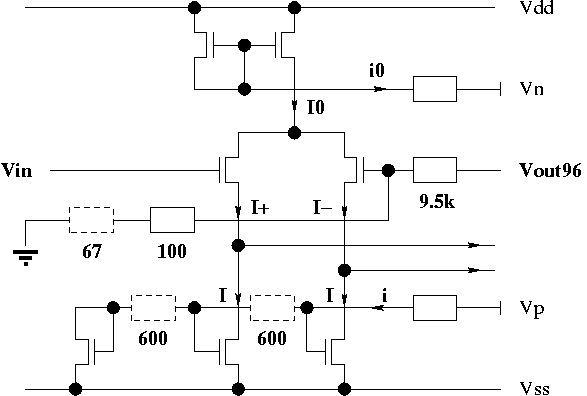 The parasitic resistor between the ASIC theoretical ground point and the actual ground pad accounts for the decrease of gain, by modifying the bridge resistor values. On the other hand, the first stage of the amplifier includes two matched current sources that were supposed to subtract the same amount of current I to the input transistor currents I+ and I-; the parasitic resistors on their grid voltage inputs create an asymmetry, accounting for the offset. The origin of this problem lies in the design of the chip : the paths to the ground pad and to the affected voltage supply are excessively convoluted, to the point that the values of the parasitic resistors adopted for the simulation are well in line with their actual geometries. This error could not be detected by the design software, since the AMS 0.35 µm package used for this chip does not take parasitic resistors into account, contrarily to the previous one (a 0.6 µm package) used by our team. On the experimental side, the existence of such resistors was proven with by measuring the current-voltage curve on one transistor of the current mirror. 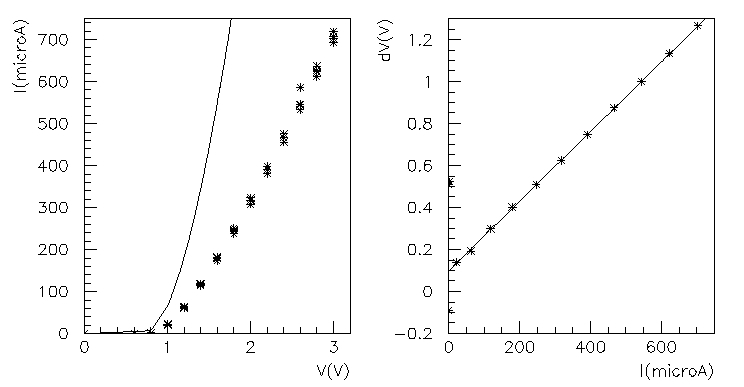 The plots below show the large difference between the simulated and experimental current-voltage caracteristics, and the linearity of the voltage difference as a function of the current. This matches what one would expect with a large access resistor (around 1660 Ohm according to this measure, comparable to the total of 1200 Ohm used in the simulation) between the voltage measurement pad and the transistor. On both channels, there is a shift in pedestal between clamping and an input of zero. The output during clamping is equivalent to an input of -1 mV on both channel, and can be explained by a section of the grounding parasitic resistor situated between the clamp 'grounding' point and the actual ground pad (this resistor was actually measured during the linearity studies). The matched current sources problem increases strongly the sensitivity of the offset to the power supply voltage : up to 0.2 mV offset variation instead of a projected 5 µV for a 1 mV variation of the supply, on the high gain channel. At its worst, power supply drift created a 5 µV drift in pedestal level during a data acquisition run, exceeding the level of noise we aimed at measuring.